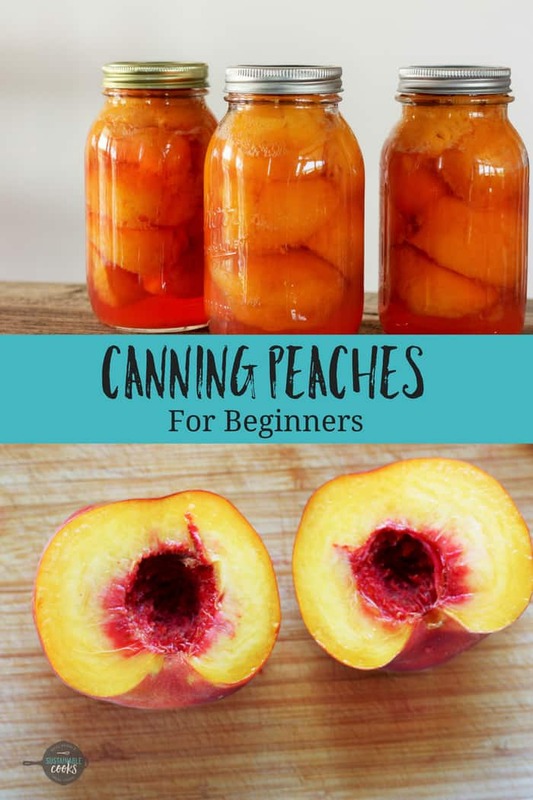 An easy step by step tutorial on Canning Peaches for Beginners. 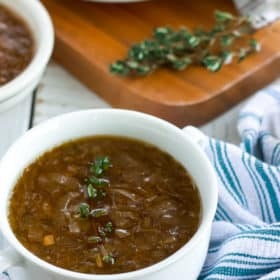 This recipe is perfect for beginners and experienced canners alike. Home-canned goods are healthier and more delicious than storebought. I remember my mom canning peaches every summer. I was always banished from the kitchen, and could only watch from the perimeter. I can recall her smile when she was done and started to hear the “pings” from the lids sealing. That meant nothing to me, but coming out to breakfast and seeing those golden half-circles in a bowl in January was always such a treat. My shift into becoming a canner started small. I planted a garden back when we lived in Los Angeles, and when the harvest started to come in, realized that it was just the two of us. Our freezer was only so big. I needed options. I started with jam, and then I didn’t touch my canning equipment for another year and a half. Jam almost caused me to stop altogether. Standing in a hot kitchen without air conditioning in August made me miserable. Stirring jam until it “gelled” was not my forte. I waited for over a year and then tried applesauce. Canning applesauce was much more my speed and was a gateway food to more canning activities for me. Applesauce turned to pears, and so on and so forth. I also eventually learned to make a delicious low sugar strawberry jam that doesn’t take forever to cook down. And even a slow cooker apple butter. Along the way, I picked up canning peaches as well. There is something amazing about having a “fresh” peach in the middle of winter. It is essentially a bowl full of sunshine. 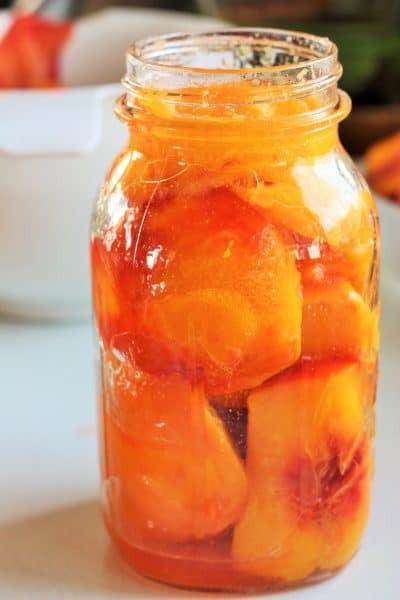 For me, canning peaches are one of the less labor-intensive foods to can. Sure, you have to peel them, but that can be accomplished fairly easily. 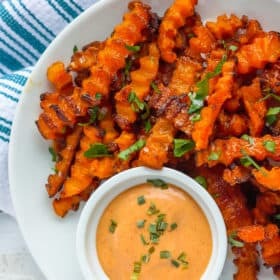 There is no saucing involved and you don’t have to wash any special equipment. I think what scares most people away from canning peaches at home, is the sugar involved! Soooo much sugar is recommended. Let me be frank and honest with you. You should always follow a trusted, official canning source. I am not official. But I have been canning for over a decade, and we’re all good. Sugar is used in canning for flavor, preservation, and color. Sweet food generally tastes better, keeps longer, and the color of the food stays bright and fresh. That being said, most fruits have enough natural sugar and don’t need anything added to be considered safe. Your final product may look a bit different but should be ok. Personally, I walk the line between no sugar and just low sugar for canning peaches and pears. I use a ratio of 1.5 cups of sugar to 6 cups of water to make the syrup that goes in these jars. Please use your best judgment when altering any official canning recipe. 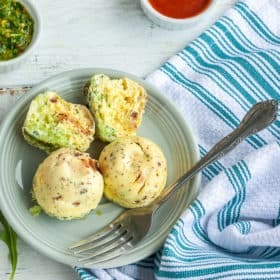 Plan to eat the finished product within 9-12 months. A quick note about the photos below. 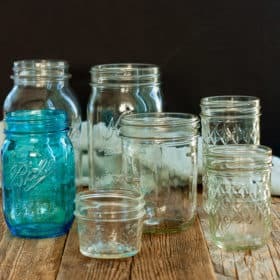 I ended up using regular quart jars instead of wide mouth jars because I was out of wide mouth lids. Big mistake. The peaches got more squished than needed. When given the choice, use wide mouth jars for peaches and pears. 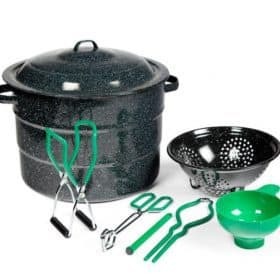 Large pot of water for blanching, a medium pot for syrup, and one small pot for sanitizing lids. Jars – quarts or pints. Peaches. Doy. If you’re purchasing peaches to can, look for “freestone” choices as they will release themselves from around the pit. Use a paring knife and cut the peach around the middle to separate. 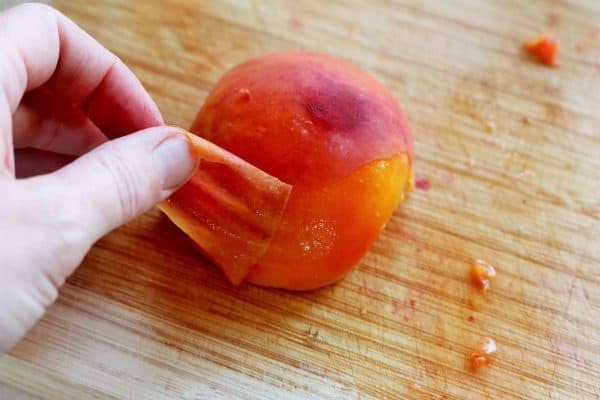 If you want slices, check out How to Cut a Peach in 15 Seconds. 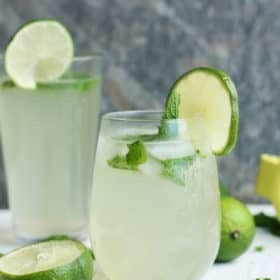 Put the halves in a large bowl of water treated with lemon juice or citric acid. 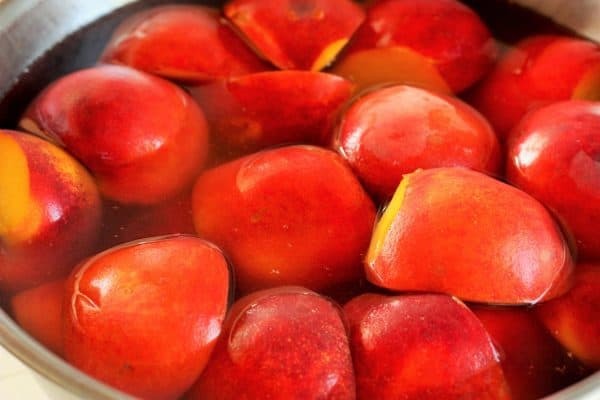 Add some of the peaches into a pot of boiling water for 30-60 seconds. Remove using a slotted spoon, and place in an ice bath for 15 seconds. Remove from the ice bath, and the skin should peel off with little issue. Should peel off easily, assuming, of course, it puts the lotion in the basket. 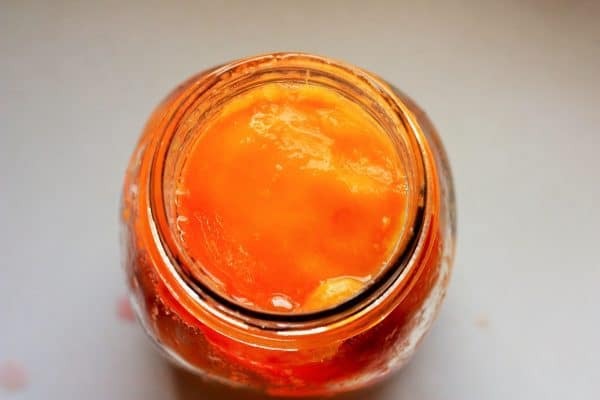 Start adding the peaches to your sanitized and warm canning jars. When you put the peaches in the jar, make sure they are cavity down. The part where the pit was should be facing the bottom. 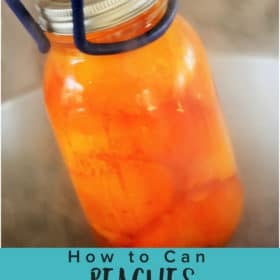 Repeat with other peach halves until you have filled the jar leaving 1/2 inch of headspace at the top. Headspace is the distance between the top of the food and the top of the jar. Start the water boiling in your canner on the stove. Place a small pot of water on the stove (or use a crockpot if you’re canning a lot) and add your clean lids. Boil for 10 minutes. 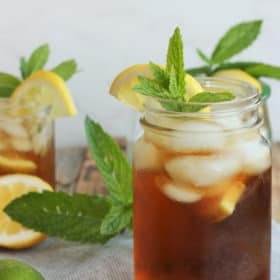 In a medium-sized pot, combine your sugar and water to create the syrup. 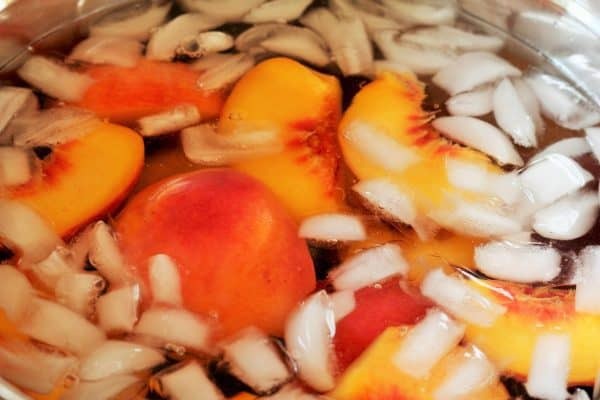 If you’re planning to do a large batch of peaches all at once, I use my crockpot to create and keep the syrup hot. It frees up space on the stove. Using a funnel, pour hot syrup into the jars, leaving 1/2 inch headspace. Using a plastic utensil (I prefer a plastic chopstick), remove all the air bubbles from the jar. 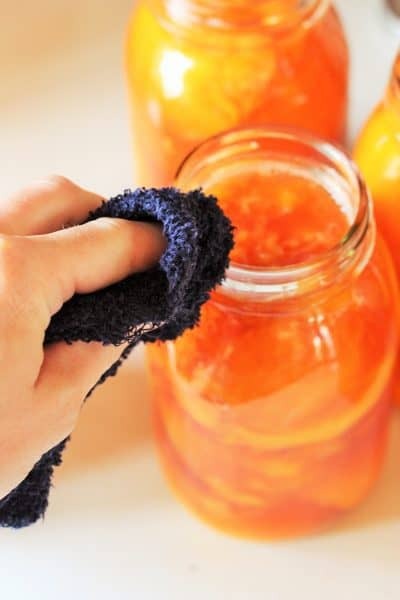 Clean the edges of the jar very well with a hot damp rag. Place a hot lid on the jar. Add a ring, and tighten to fingertip tight. Place your jars in the canner. Put the lid on, and set your timer. Pints should process for 20 minutes, and quarts for 25. I always add 5 minutes to my timer to allow the water to get back up to a boil after adding the jars. Once the peaches have processed for the appropriate amount of time, remove the canner from the stove and allow it to sit for 5 minutes. I tend to just slide it into the middle of my stove, as it weighs a ton. Carefully remove the jars, and place them on a thick towel in a place where they can be undisturbed for 12 hours. The lids should start to pop within 20 minutes of being removed from the water. That popping sound is music to your ears, as it tells you that everything has sealed. After the 12 hours of sitting are up, press down in the middle of each lid. If it “gives” at all, the jar didn’t seal. Either enjoy it that day, put it in the fridge, or reprocess it. 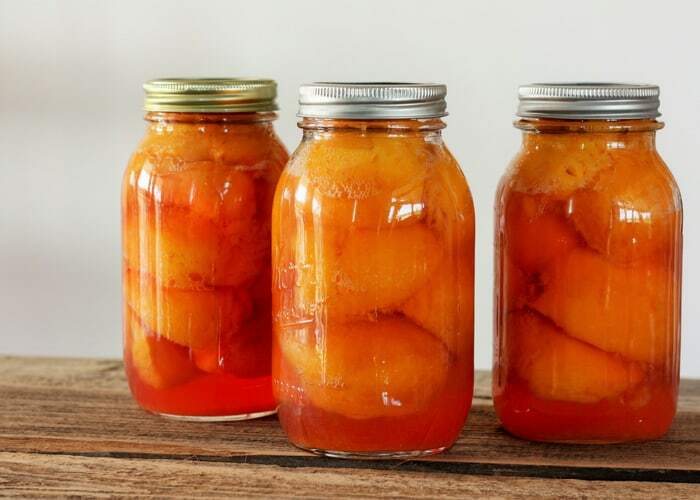 An easy step by step tutorial on Canning Peaches at home. 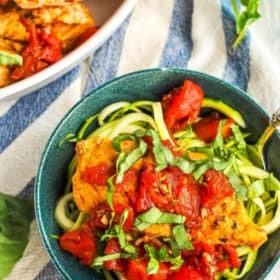 This recipe is perfect for beginners and experienced canners alike. Wash your peaches. I just run them under water and rub my hands on them to give the fuzz a scrub. 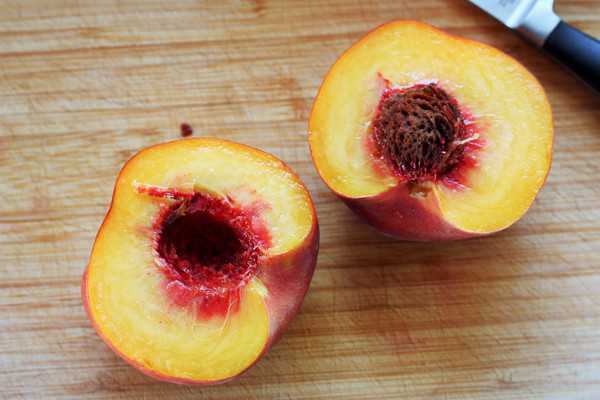 Use a paring knife and cut the peach around the middle to separate. Remove the pit. 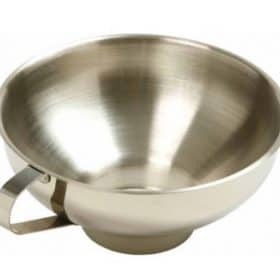 Put the halves in a large bowl of water treated with lemon juice or citric acid. Add some of the peaches into a pot of boiling water for 30-60 seconds. Remove using a slotted spoon, and place in an ice bath for 15 seconds. Start the water boiling in your canner on the stove. Place a small pot of water on the stove (or use a crockpot if you're canning a lot) and add your clean lids. Boil for 10 minutes. 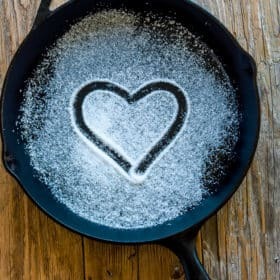 In a medium-sized pot, combine your sugar and water to create the syrup. 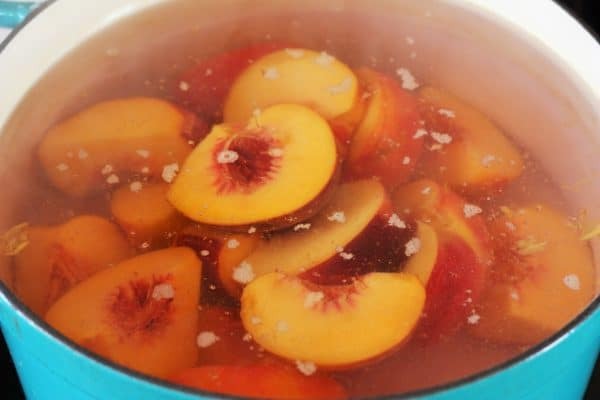 If you're planning to do a large batch of peaches all at once, I use my crockpot to create and keep the syrup hot. It frees up space on the stove. Using a funnel, pour hot syrup into the jars, leaving 1/2 inch headspace. Using a plastic utensil (I prefer a plastic chopstick), remove all the air bubbles from the jar. 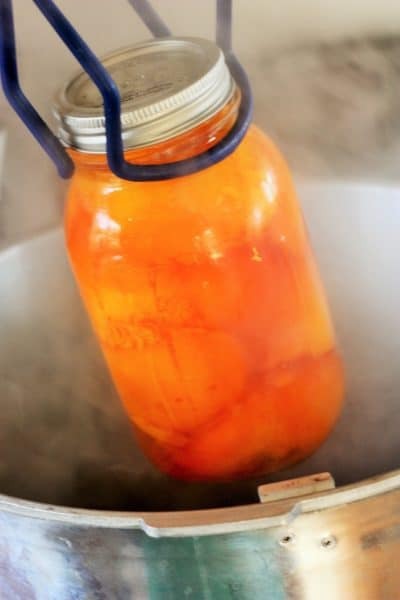 Once the peaches have processed for the appropriate amount of time, remove the canner from the stove and allow it to sit for 5 minutes. I tend to just slide it into the middle of my stove, as it weighs a ton. Carefully remove the jars, and place them on a thick towel in a place where they can be undisturbed for 12 hours. The lids should start to pop within 20 minutes of being removed from the water. That popping sound is music to your ears, as it tells you that everything has sealed. After the 12 hours of sitting are up, press down in the middle of each lid. If it "gives" at all, the jar didn't seal. Either enjoy it that day, put it in the fridge, or reprocess it. Thanks for the post. There’s is nothing better than a perfectly ripe peach, is there?? My husband and I can amazing organic peaches we order from amazing WA state each year and EVERY TIME time they end up over-processed. Like, “you can’t pick them up with a fork” over-processed. The only thing I’ve come up with is that the canner takes too long to come back to a boil before I begin the timer. Tell me, while you are packing each jar, where are the other jars sitting? Mine sit in a 200-degree oven until they are all full to keep them hot. 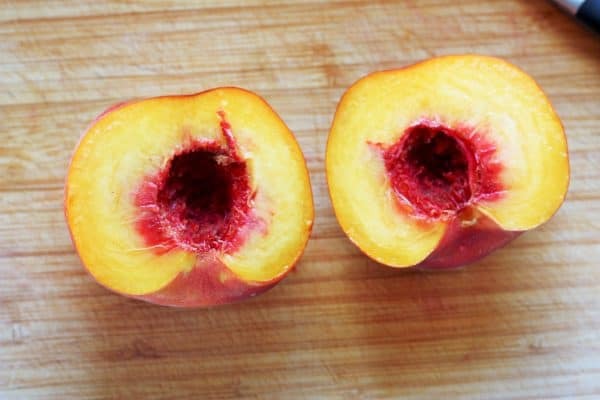 Could this be the cause of mushy peaches? I’m paranoid a jar will break in the canner (it’s only happened once) or they will lower the canner temp too much, so I keep them as hot as possible through the process. 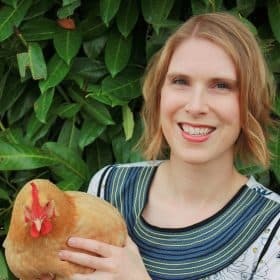 A few questions for you. What kind of syrup are you using? 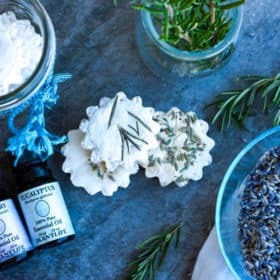 Are you doing a raw pack or hot pack? For peaches, my jars are sitting on the counter full of hot water. 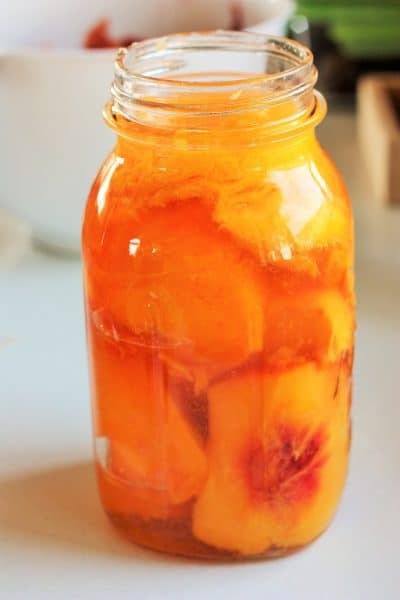 I use the jar in the oven method for certain types of canning, but not peaches. 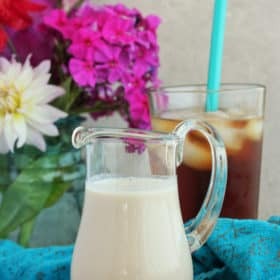 I’ve tried both light syrups (one time with sugar, one time with honey) and one time plain water. All 3 were cold pack. Same results every time – sloppy peaches. I’m wondering if the peaches are too ripe when I can them?? I’m canning them at the same ripeness that I would choose to eat them, but maybe I need to can them when they are a little firmer? 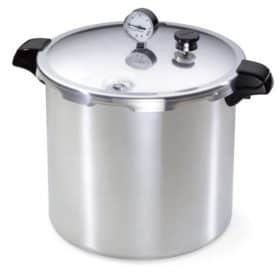 Are you processing in a water bath canner or pressure canner? Are you doing 25 minutes processing time? The peaches I can are ripe enough to eat, but not so ripe that they’re hard to handle. Yup, quarts in a water bath canner, for 25 minutes…but that doesn’t include the amount of time it takes to get the water back up to boil once I take the lid off and add my first jar. It takes me so long to get all 6 jars filled with fruit and syrup and I set each jar in the canner as I fill it…is that right? Or should I leave filled jars on the counter and put them all in the canner at once?? The directions are never clear on this step! I always worry my jars won’t be hot enough when they enter the canner, hence the use of the oven. Ok, ding, ding, ding we have solved the problem! Yes, you need to put all the jars in at the SAME time and then start the countdown. I fill a jar with peaches and then ladle in the hot syrup. Then I take the next hot jar (you could remove it from the oven at this point. I just dump the hot water out of it), fill it with peaches, and then put the syrup in. Continue until I have 7 quarts done. THEN I clean the rims on all of them, THEN I put the lids on all of them, THEN I do the rings for all of them. The whole time this is going on, the lid is still on the canner. I open it just one time and put the jars in. It is easier to keep the water from dropping too much temp that way. I think if you try the above method, your peaches will stay much fresher. Presto! So you rely on the hot syrup to keep the glass hot enough to prevent breakage. I didn’t think you could do that. I’ve only had one jar break in the canner with my method and it has me completely paranoid!! Thank you SO much for your time!!! 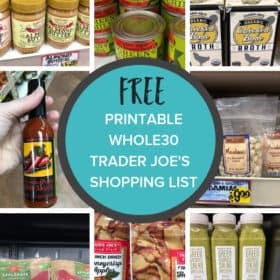 Thank you for sharing Devonna! I’ve canned in water before, and I didn’t have great results. But it definitely could have been user-error. Plus, our garage stays so warm and that is where we keep our canned goods. looks pretty easy and doable! 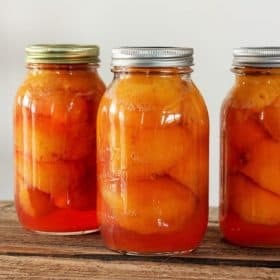 What peaches do you prefer to use for canning? 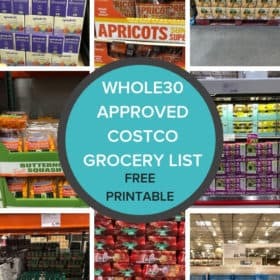 Anything that is labeled as “freestone”. Those are the ones where the pit pops out easily. The kind most readily available about our farmer’s market is “Elberta”. 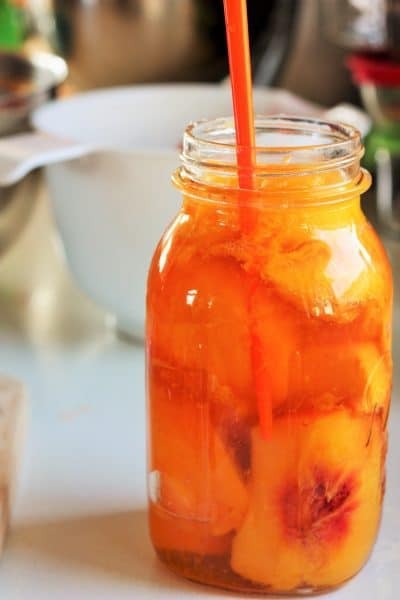 Hi there wondering what ratio of peaches you used for that much water and sugar? 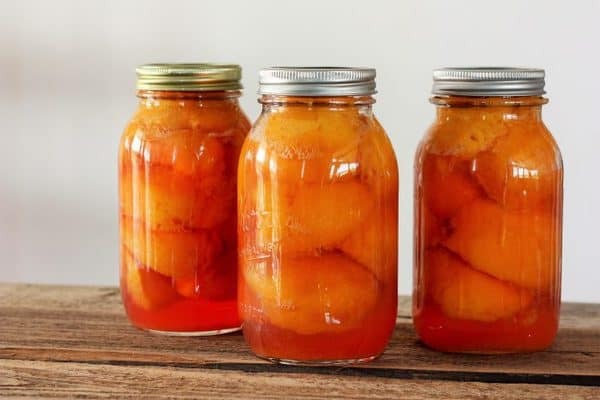 I have been looking for a recipe with a very light syrup rather than such a heavy one as is called for in so many recipes for canning peaches. I’ll be honest in that it varies based on the weight of the peaches, etc. For 8 quarts I probably use about 1.5 times the syrup recipe. 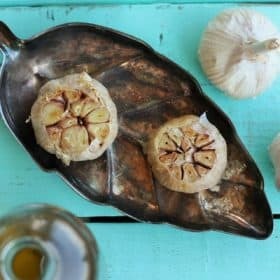 As someone who has never tried preserving anything, this actually looks do-able. What a great tutorial! Now you’ve got me craving peaches (and singing that Peaches song from the 90’s)! You can do it, Christine! Though someone from the UK messaged me and told me the price of canning jars over there and it was outrageous!